Brave and Happy: Bringing it home! 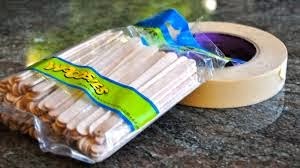 Last week, my sixth grade son opened his backpack and removed several straws and popsicle sticks held together with masking tape. He excitedly jumped on the floor to re-create the catapult he made in science class. The truth is, he is a tough customer when it comes to being entertained at school. He regularly calls school "normal" and rarely says his days are good. This day was quite different. I watched him from afar because I didn't want to stifle his creativity. I loved seeing his brain work through his fingers to make another, even better catapult. I loved that his school assignment carried over to further exploration at home! He stayed with it for quite awhile, testing and refining and testing and refining. He was excited to show me his progress! It was tough not to play the role of teacher at this point. He needed me to be the excited parent! And believe me, I was excited! After a little more than a week, he has gone back to his interest in catapults and rubber-band propulsion several times. I love that he has unknowingly become a little scientist and I love that he brought home this excitement from school!